Feel free to browse and use the images and content in M.A.D. 's Press Kit. 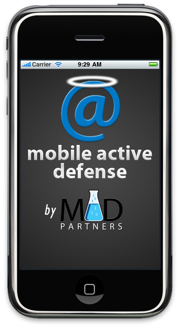 Mobile Active Defense is the first iPhone Security App. M.A.D. combines the best of Enterprise grade SPAM and virus protection on iPhones and other smart phones without having the slowdown of running software on your smart phone. Using M.A.D. 's patent pending cloud technology, all of your emails are screened over our servers before they ever reach your phone guaranteeing that you only receive the pure email you want. Because of the unique way M.A.D. functions, it works with your existing smart phone email application. Copyright 2019 M.A.D. The Smart Phone Security Company. All rights reserved. - View Full Version of this Press Kit.